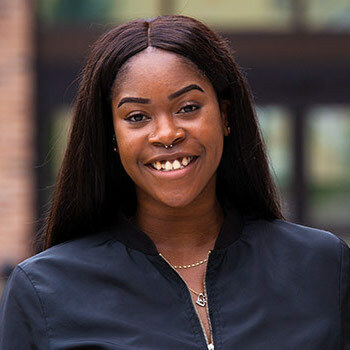 When Elizabeth Clarke walked across the Sanderson Centre stage in Brantford to receive her Bachelor of Social Work from Wilfrid Laurier University, she graduated not only as an exemplary student leader with an A average. She graduated as a survivor. Clarke has been through more challenges in her 21 years than many people experience in their lifetimes. Taken into foster care at a young age, she was later adopted, only to lose her father at the age of six and her mother this past winter. The supportive community around her at Laurier helped her keep going – and thriving. Clarke was born in Toronto but knows little about her birth family. At the age of three, she went to live with the Oshawa family that would later adopt her. She had three adoptive siblings plus foster siblings. It was a busy household but not an unhappy one. Everything changed during the great blackout of 2003. Her father had suffered a stroke a few days before and her mother was surprised he was already being sent home from hospital. Clarke remembers her father coming home in a cab in the pouring rain, in pitch blackness. Her mother struggled to help him. As soon as he was inside, he collapsed in the hallway. He had a blood clot in his heart. He died later that night. Clarke can only imagine what her mother must have gone through as she struggled to plan the funeral, look after her large brood and make ends meet on an ongoing basis. Growing up, Clarke always knew money was tight but she and her siblings never went hungry. They participated in activities such as sports and Girl Guides. She recognizes now how hard her mother must have worked and sacrificed to make those things possible. When she first went to high school, Clarke didn’t think she would go to university. However, with encouragement from teachers, she ended up excelling both in classes and as a runner. When the time came to decide what to do next, Clarke visited Laurier’s Waterloo campus and heard there was a good track team. She didn’t realize majoring in social work meant she would be going to the Brantford campus. Clarke ended up loving her program and her “phenomenal” professors. Despite the lack of a track team, she stayed fit, made friends and got involved in plenty of extracurricular activities. She served as a Residence tour guide and by the end of her first year, had no hesitations about returning to Laurier’s Brantford campus. Then, during Clarke’s second year, her mother fell ill. It turned out to be lung cancer. Doctors estimated she had six months to live but she survived more than two years. During that time, Clarke went home most weekends, a four-hour trip by public transit. Not only were the frequent trips time-consuming, they were emotionally wrenching. Clarke remembers helping her mother remove a hair weave that was hurting her head. Neither of them expected her own hair to come out with it. It was hard to maintain an appearance of normalcy at university but Clarke tried. Because it was difficult to get much done at home, she often returned to campus on Sunday night and worked until the wee hours. Sometimes she had no choice but to hand in assignments late. Nonetheless, Clarke kept up her schoolwork as best she could. Clarke credits the Dean of Students Office, particularly Student Support Coordinator Andrea Dalimonte, with helping her coordinate things like extensions on assignments, so her marks didn’t suffer too much. The Dean of Students Office also helped Clarke secure funding available to former Crown wards in postsecondary education, funding she didn’t know existed and which helped alleviate her financial burden. Counsellors, particularly Jodie Lockey-Duesling, helped her talk out her feelings. “If it hadn’t been for Jodie, I don’t think I would have finished the school year,” says Clarke. In addition to her courses, Clarke worked a part-time job at the YMCA and volunteered extensively. She was a member of the Peer Education Wellness Team, vice-president of the Bachelor of Social Work Student Association and secretary of Laurier’s World University Service Canada (WUSC) group. She was also coordinator of Inward, a peer connection group by and for students of colour, and helped out with the Laurier English and Academic Foundation (LEAF) program. During the 2017 fall term, Clarke completed a field placement with the Diversity and Equity Office (DEO), assisting Lauren Burrows, education and inclusion coordinator for the Brantford campus. She continued working with the DEO part time in the winter term, even after her mother died in February. Helping others also helped Clarke get through her challenges, she says. Clarke looks forward to a helping career. She is currently volunteering with the Children’s Aid Society in Toronto and hopes to start a master’s in social work in 2019. Laurier helped show her the way, both by helping her and by giving her opportunities to help others, says Clarke.